Banners with “Teachers for Gender Equality” written on them were hanging on both walls and on the stage at the Children Development Center, a migrant school in Mae Sot, a Thai town on the border between Thailand and Burma. The Children Development Center was hosting the 2011 World Teachers’ Day celebrations. Since 1994, World Teachers’ Day is held each year on 5th October and this year’s event will be the fifth anniversary for the Mae Sot migrant school. In keeping with the 2011 slogan, the attendants at the ceremony are of equal numbers of male and female gender. Before attendees are seated in the celebration hall, a speaker booms to remind teachers to register and to state in the registration what document of identity they are holding. School committee members and teachers from 74 migrant schools in the Tak province of Thailand, together with some students have attended the ceremony. The ceremony was organized by the Burma Migrant Teacher Association and financially supported by the biggest education non-governmental organization on Thai Burma border, World Education and local community based organizations. The packed hall is filled with busy chatter as teachers greet and talk. Dr. Cynthia Maung gave the opening speech. Dr Cynthia is the founder of the Mae Sot based Mae Tao Clinic that treats tens of thousands of patients each year from the migrant populations, along the border and from inside Burma. Dr. Cynthia said that there are many difficulties and challenges for migrant teachers educating children from a social and political conflicted society. Mr. Greg Anots, a director with World Education in Thailand, a nonprofit NGO supporting education for migrants and refugees along the Thai Burma border, asked all the attendees to close their eyes and imagine a teacher who taught them when they were children. After hearing responses from attendants, Mr. Greg Anots then said. 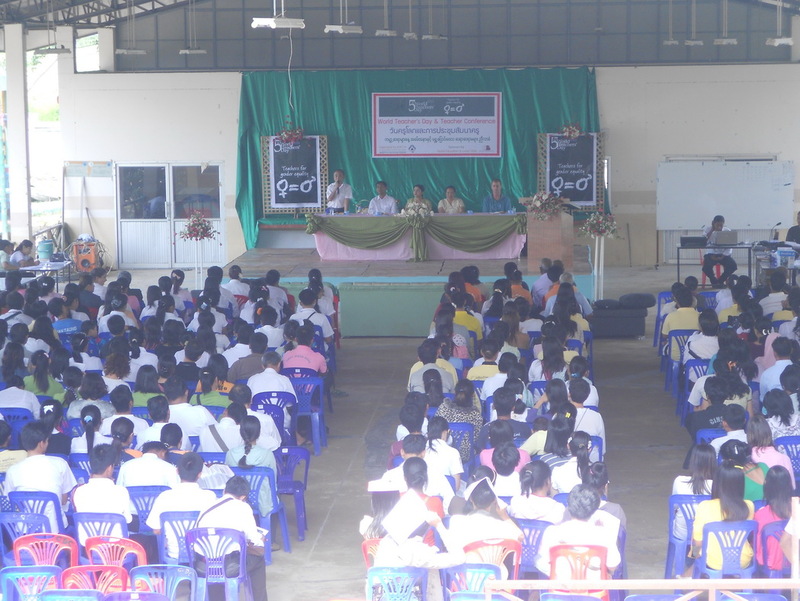 A Tak provincial education official was an honor guest of 2011 World Teachers’ Day celebrations in Mae Sot. He gave a speech on teacher ethics and their obligations to their students as outlined in the Thai education system. He explained in detail about how teachers must not exploit their students and how to honor and respect students. In response to the Tak Provincial Education official’s speech, a teacher from a migrant school in Huay Kloat area in Mae Sot district said he found it interesting. In Burma, although World Teachers’ Day is not recognized as a special day, on every Burma month of Thadingyut [September-October], students pay homage to their teachers by giving them presents. A United Nation’s letter issued for the 2011 World Teachers’ Day celebrations said that majority of the illiterate and school dropouts are girls as boys are often given priority. The letter said that it is not only the fault of the individual family, but it is also the responsibility of the State. The letter also mentioned that there is a world shortage of two million teachers. Dr. Thein Lwin, an advisory board member of BMTA said in his speech that support for teachers is not enough and teachers have to invest more of their own time and resources than what they gain in material benefits, and this needs to be acknowledged by the international community. Dr. Thein Lwin said that he admires and respects teachers who continue to work in these difficult conditions. A teacher from Zaydana migrant school said that the current situation is hard and they can’t hire enough teachers. The ceremony continued with reading of poems and songs composed by teachers with words honoring each other. Each presentation was followed by loud applause and the ceremony facilitator ended the presentations by saying that teachers also have to pass over their art talents to their students. Mrs Sabae, the treasurer of BMTA told the audience that they haven’t able to raise funds from any donor or funder over the last two years. Donors providing assistance to migrant school in the Mae Sot area also made their goal clear to the audience. The donor statements also included keeping full record for each student including enrollment and disenrollment. A young teacher from Huay Kloat migrant school said this level of detail helped him to understand the situation better. BMTA is a democratically elected group of representatives from 74 migrant schools and work according to a constitution drafted by members. Currently there are over 700 teachers in the association. A high student volunteer helping with the celebrations said he now realizes the difficulties faced by teachers.